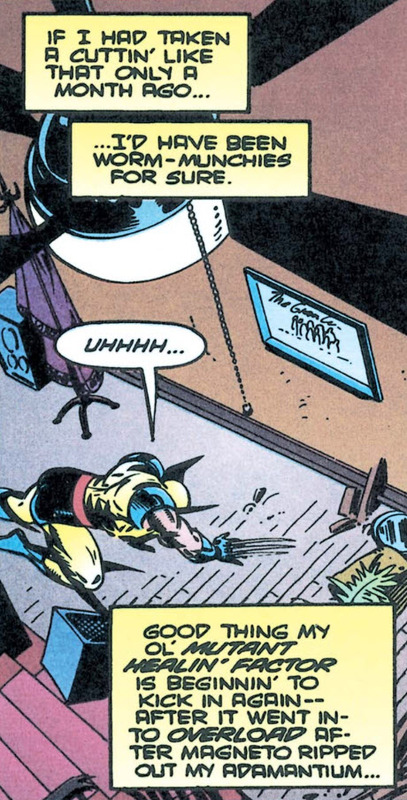 Asked to check on Garrison Kane by James Hudson, Wolverine arrives at the apartment in San Francisco where Kane lives with Vanessa to find Deadpool waiting. 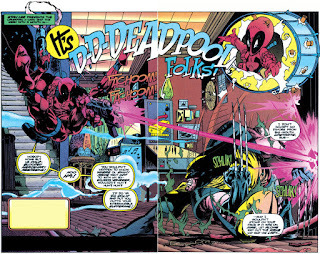 With Wolverine's healing factor still not at full strength, Deadpool overpowers him and heads off in search of Kane & Vanessa, who are working at a local theater. As Wolverine pulls himself together, he spots Vanessa in a picture amongst a theater company and figures that's where Deadpool is heading. He stumbles outside and hails a cab. At the theater, Deadpool attacks Kane & Vanessa, hurling one sword at each of them, forcing Kane to choose between saving himself & saving Vanessa. 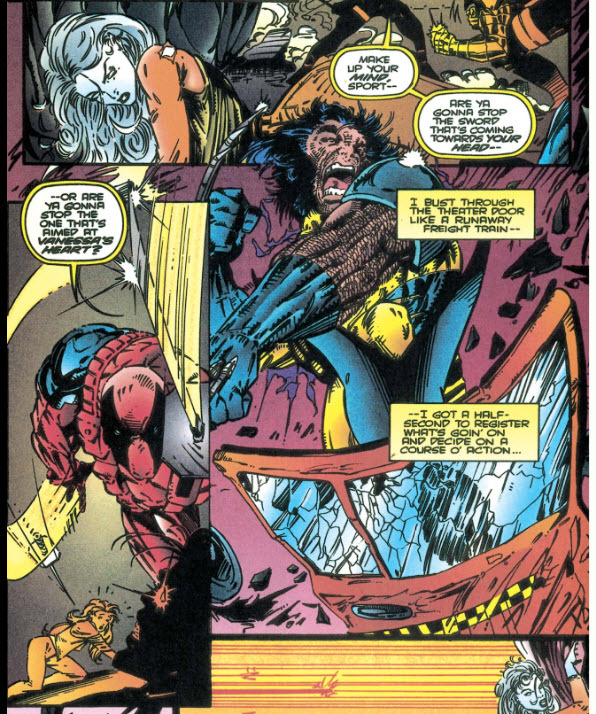 Kane deflects the sword coming at him, just as Wolverine arrives & saves Vanessa. Outnumbered, Deadpool tosses a grenade to cover his escape. Later, Wolverine tells Vanessa not to be too hard on Kane, as if he allowed himself to be killed, he wouldn't have been able to save her anyway, then wishes them both well, saying it's finally time for him to go home. 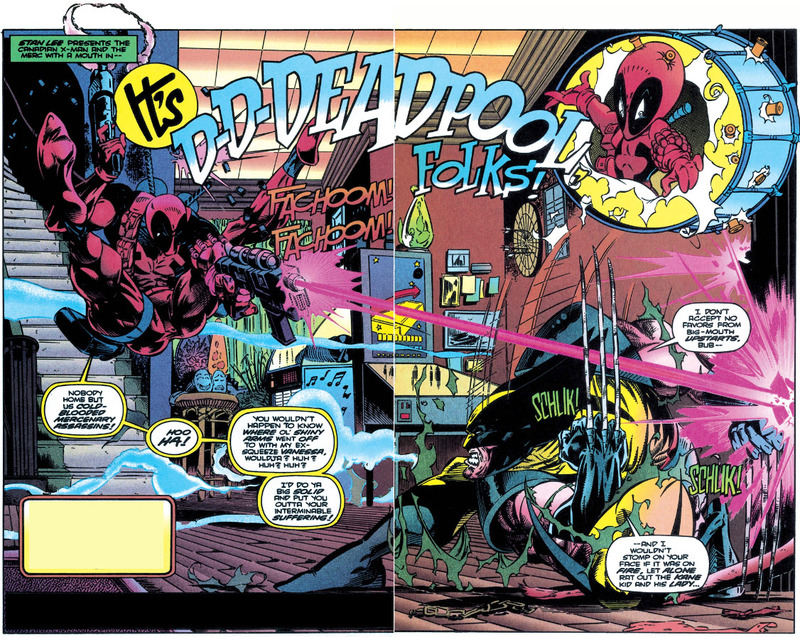 Deadpool & Wolverine meet for the first time in this issue (publication-wise, at least). and it's somewhat remarkable both that it took this long and that not a bigger deal is made of it. Of course, Deadpool isn't yet as popular at this time as he is now, but the character definitely had a following (considering he'd already earned himself two limited series), and given both characters shared "kewlness", it's surprising they weren't brought together sooner. 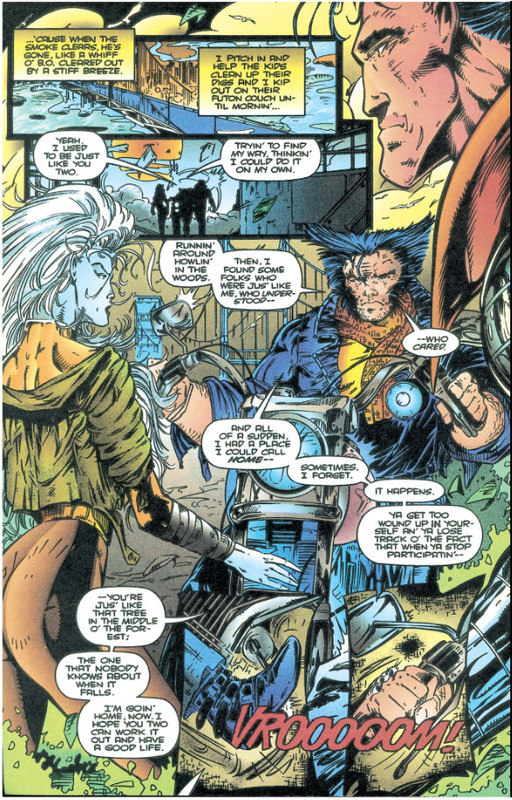 The pages "drawn" by Fabio Laguna in this issue feature some of the more notorious examples from this era of swiping, with Laguna copying over figures from, chiefly, Jim Lee's Omega Red story from X-Men #4-7. Wolverine says that James Hudson asked him to check up on Kane, something we didn’t actually see in issues #83 and #84 (also, James Hudson apparently knows and is concerned about Kane). In addition to all the swiping, as soon as Laguna takes over, Kane goes from wearing street clothes to his six pack uniform. In his swiping, it also looks like Wolverine has metal claws again (since, of course, in the original image he's swiping, Wolverine had metal claws). Wolverine notes that his healing factor is working faster of later, presumably starting to recover after being overworked following the removal of his adamantium. Plotwise, this is fine; it features a surprisingly-long-in-coming meet up between Wolverine & Deadpool, probably spends too much time on "Wolverine taking a cab" shenanigans, and the extent to which Deadpool threatens Vanessa's life seems out-of-character, but it works well enough as a vehicle for some action and a way to highlight Wolverine's decision to return home after twelve issues (and counting) away. And there's few problems in the Adam Kubert-drawn portions of the issue (though the preponderance of double-page spreads made this more difficult to read on my iPad than I'd like, not that such is or ever was Kubert's concern). But hooboy, when Fabian Laguna takes over, do things get rough. When he's not swiping Jim Lee to such an extent that it's obvious even to me, the art is chicken-scratch worthy and barely coherent. 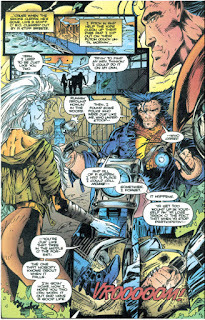 It called to mind some of the extremely rough, non-Alan Davis drawn issues of Excalibur (which is never a good thing). Which is a shame, because it mars what is otherwise a fun, action-orientated character meetup, and a semi-historical first encounter between Wolverine & Deadpool. Next week: X-Men (vol. 2) #39, X-Force #41 and Excalibur #84! The sword thing makes no sense anyway. Wouldn't moving in such a way as to rescue Vanessa also take Kane out of the line of the sword aimed at him? Yeah, this is where I feel like maybe Hama was trying to cover for the art? And not doing a very good job of it? 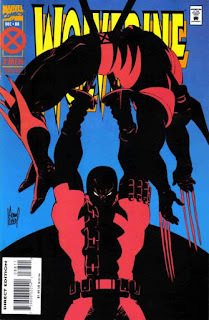 When I dropped down from 170+ long boxes to just 14, this was an issue I was going to keep as I remember it beeing Kwool as a kid, when I did a quick look at it to see if it made the 14 boxes, oh man, it's bad, haha. I didn't even realize Kubert did any of this issue, it's just bad. I didn't know they were swipes though. What a terrible script by Hama too, Copycat and Kane as actors is just stupid and that how if Deadpool had wanted her dead, it would have happened way before Wolverine randomly decides to check in with them. This just felt like a throw-away script and it makes me mad that I paid money for it at the time and that it has some collector value now as an early appearance of Deadpool. Woof, 170+ plus long boxes is impressive! At the peek of my collection (I've been slowly winnowing it down for years), I had probably ~75 longboxes, and that was daunting (in terms of moving, organizing, etc.). I can only imagine what 170 was like! I will be speaking a bit to that sensation in the review for next issue, but totally agree. I'm not sure how to get images on here, but I had two of those 4 row racks from Costco and you could get I believe 8 boxes per rack incl. the bottom shelf, so 40 per rack and those two shelves held my own personal collection, so around 80 long boxes and then the rest were on tables and below tables and I used that all as my trade/sell stock and I started doing Comic Con here in Utah where I soon found out that comics simply don't sell in a state where comics were never big and moved heavily into the video game space instead and have spent 4 years doing conventions with video games. That's when I knew I needed to get rid of so many comics. I'm big into buying full series and then eventually reading them. I had every Malibu/Ultraverse comic even though I had never read one of them, same goes for Crossgen, Tekno Comix and almost all of Valiant but I had read and liked some of the Valiant books. I had every X-book ever made at that point, missing around 10 Silver Age and current Green Lanterns, and just so many titles and full runs and I needed to cut down. I was also going to finish my 1,600 sq ft basement where all of this was stored and realized I wanted to get rid of them instead of having to figure out where they go when it was done. I would usually resort all the books I had bought each year over Thanskgiving or Christmas days off and once it started taking over a week to just reorganize and track what I had added each year, it was just out of control. I thought for sure that was a Tim Sale cover until taking a close look at the signature.